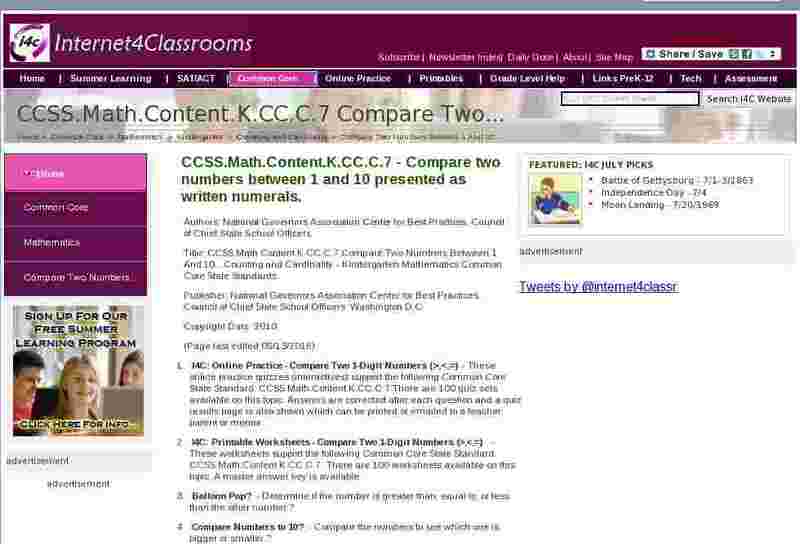 CCSS.Math.Content.K.CC.C.7 - Compare two numbers between 1 and 10 presented as written numerals. I4C: Online Practice - Compare Two 1-Digit Numbers (>,<,=) - These online practice quizzes (interactives) support the following Common Core State Standard: CCSS.Math.Content.K.CC.C.7. There are 100 quiz sets available on this topic. Answers are corrected after each question and a quiz results page is also shown which can be printed or emailed to a teacher, parent or mentor. I4C: Printable Worksheets - Compare Two 1-Digit Numbers (>,<,=) - These worksheets support the following Common Core State Standard: CCSS.Math.Content.K.CC.C.7. There are 100 worksheets available on this topic. A master answer key is available. Balloon Pop? - Determine if the number is greater than, equal to, or less than the other number.? Compare Numbers to 10? - Compare the numbers to see which one is bigger or smaller.? Greater or Less than - Pick the symbol that fits in between the numbers. Greater than - Which greater than statement is correct? Island Equation Map - Lesson plan with materials to create game. More or Less? - Compare two numbers and determine if one is "Less Than", "Equal To", or "Greater Than" the other.